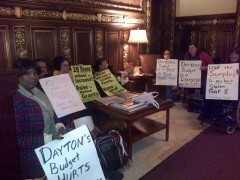 Welfare Rights Committee sit-in at MN governor’s office demands money for low income families | Fight Back! St. Paul, MN - On March 25 Welfare Rights Committee (WRC) members sat in at Minnesota Governor Mark Dayton’s office throughout the morning to demand welfare grant increases for poor families in Minnesota. The sit-in was timed to coincide with a Senate hearing on bills pushed by the Welfare Rights Committee. 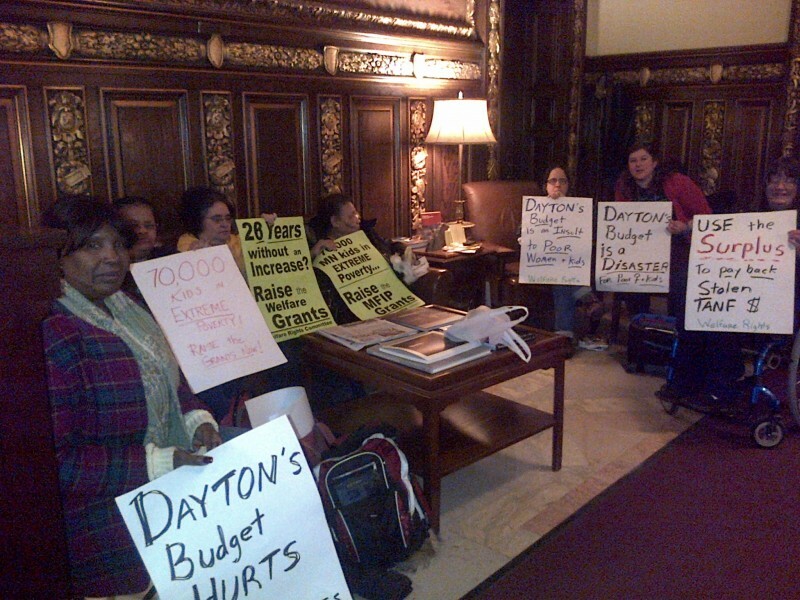 “Use the surplus to pay back stolen TANF money,” and “Dayton’s budget hurts poor families!” were just two of the many signs visible to anyone who came by Governor Dayton’s office that day. The WRC put forward bills this legislative session that move up the implementation dates of victories from last year. They want to put money in the pockets of poor families in the form of increases to the cash welfare grants. These increases would be the first since 1986 - 28 years ago. In Minnesota, welfare cash grants for the poorest families have not been increased since 1986 - 28 years ago. The cost of living has doubled since 1986. The monthly cash grant for a family of two is $437 per month, “not enough to pay rent for legal housing in most towns, much less other needs,” according to WRC. Because the current welfare grant levels, 70,000 Minnesota children live in extreme poverty - over 60% below the poverty level. This extreme poverty has a devastating effect on children, who are the majority of welfare recipients. Minnesota, like many states, has a surplus after several years of deficits. Now Governor Dayton is pushing for the surplus to be given to Minnesota business owners. “We know what the right thing to do with the surplus is. It’s to give it to the 70,000 children in extreme poverty. Instead of coming up with excuses like computer glitches, they should focus on our children,” stated Evelyn Evans, a member of the Welfare Rights Committee who sat in at Governor Dayton’s office. Evans was referring to an argument given by Governor Dayton’s Department of Human Services that it was unable to program its computers to give an increase to welfare grants. During the sit-in, WRC members gathered support from other groups that also happened to be at the capitol that day, including AFSCME union members who were there for their annual lobby day. Over 100 capitol visitors signed on postcards supporting grant increases. The postcards were delivered directly to the governor’s office.